During the past week, a number of commemorative events were held at Bilkent to mark the eighth anniversary of the passing of Bilkent University’s founder, Prof. İhsan Doğramacı. These included two panel discussions and two concerts. 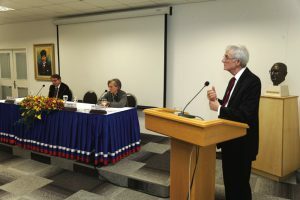 The panels took place on February 22 and 26. 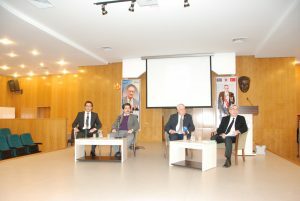 The Main Library hosted the first panel, during which Prof. Adnan Akay, Dr. Phyllis Erdoğan and Dr. Işın Metin discussed the topic “İhsan Doğramacı’s Approach to Communication: Multiple Languages, Including Music” and shared their memories of Hocabey (as Prof. Doğramacı was affectionately known). In her remarks, Dr. Erdoğan highlighted Prof. Doğramacı’s extraordinary talents as a communicator. “He was a great linguist,” she recalled. “And he had lots of plans; he was always thinking of the future and had many ideas, many projects, which he loved to share with people. He was an eager communicator to anyone. The second panel, titled “İhsan Doğramacı Through the Eyes of Youth, and the Place of Turkmen in the Turkish World,” was held on February 26. The panelists were Tümerkan Akın (LAW/IV), Halil Kerem Aydın (POLS/III) and Dr. Rasim Özyürek (Director of Training Programs for Regional Countries) and the moderator was Kamer Rodoplu (Dean of Students). Given Prof. Doğramacı’s well-known love of music, as discussed during the February 22 panel, the two concerts were an especially fitting commemoration. On February 21, the Bilkent Music Days series offered a “Tribute to Hocabey,” with Mozart’s Violin Concerto No. 5 (“Turkish”) and Tchaikovsky’s “Nutcracker” Suite played by the Bilkent Symphony Youth Orchestra under the baton of conductors Işın Metin and Barış Demirezer, with violin soloist Nilüfer Sude Güçlü. 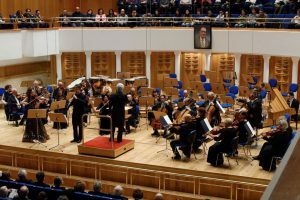 On the evening of February 25, the Bilkent Symphony Orchestra gave a second concert dedicated to the memory of Prof. Doğramacı. The orchestra, conducted by Gürer Aykal, performed pieces by Mozart, Bach and Shostakovich, with soloists Philippe Grauvogel (oboe) and Irina Nikotina (violin).